Hundreds of sand dunes are visible as dark lines snaking across the surface. Saturn’s largest moon, Titan, appears to have a large area of dunes, according to new images released by the U.S. space agency. The radar images came from NASA’s Cassini probe as it made a close flyby of Titan July 25, passing as near as 976 kilometers from the moon. NASA thinks the dunes are made up of “grains derived from hydrocarbons that have settled out of Titan’s atmosphere.” The dunes appear to circle most of Titan’s equator, and researchers say that they will be helpful in understanding winds on the moon. "Dunes are dynamic features. They're deflected by obstacles along the downwind path, often making beautiful, undulating patterns," said Jani Radebaugh, a Cassini radar team associate at Brigham Young University in Provo, Utah. Xanadu is the first surface feature to be spotted on Titan, having first been seen in 1994 by the Hubble Space Telescope. "This 'annex' looks quite similar to Xanadu using our radar, but there seems to be something different about the surface there that masks this similarity when observing at other wavelengths, as with Hubble," said Mike Janssen, also a Jet Propulsion Laboratory ((JPL)) member of the radar team. "It's an interesting puzzle." NASA says the areas appear to be quite old. "These mountainous areas appear to be the oldest terrains on Titan, probably remnants of the icy crust before it was covered by organic sediments from the atmosphere," said Rosaly Lopes, a Cassini radar team member at JPL. "Hiking in these rugged landscapes would likely be similar to hiking in the Badlands of South Dakota." Cassini has now made 122 encounters with Titan since it arrived at Saturn in mid-2004. It is the last time the probe will examine the far southern regions of the moon. "If Cassini were orbiting Earth instead of Saturn, this would be like getting our last close view of Australia," said Stephen Wall, deputy lead of the Cassini radar team at NASA's Jet Propulsion Laboratory in Pasadena, California. Cassini will now focus its flybys on liquid-filled lakes and seas found in the extreme north of the moon. 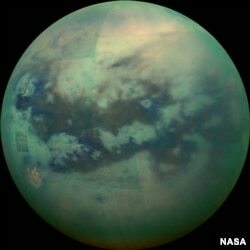 Titan is the only other world astronomers know of that has stable liquid on its surface; but, instead of the water that drives Earth's hydrocycle, Titan's rivers, lakes, seas and oceans are filled with liquid hydrocarbons such as ethane and methane. Cassini first confirmed the presence of liquid ethane in a lake called Ontario Lacus, in Titan’s southern hemisphere, during its 2008 flyby of the Saturnian moon. Astrobiologists think the moon could have the chemical building blocks required for the creation of life.